Diamond tails always seem to deliver a crisp, tight turn, especially when the board doesn’t carry a lot of tail kick. I’ve used these properties to make a firm turning, fast, full-volumed quad. From 6’0” down, these critters scream through mush and come alive with plenty of hold for juicier surf. 6’4” and up, they make a superb bigger guy quad, with plenty of tail volume to prevent the tail from sinking when it slows down. Both carry a goodly amount of nose rocker. 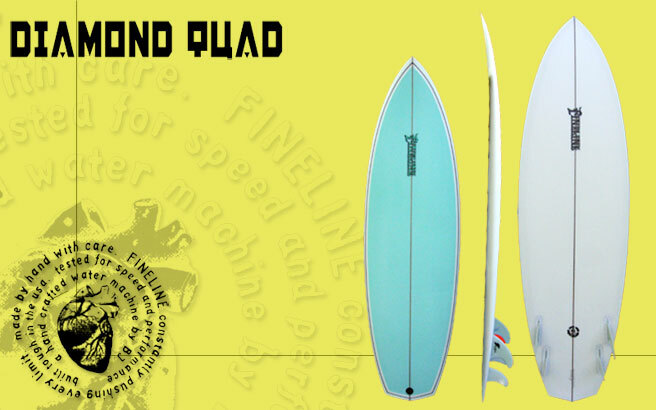 The bottom is a flat, neutral front, to a mid-stance concave, to a bonzer-like tunneled V for quick rail-to-rail turn love. I like the Future F4 front with the 3/75 pivot in the back.